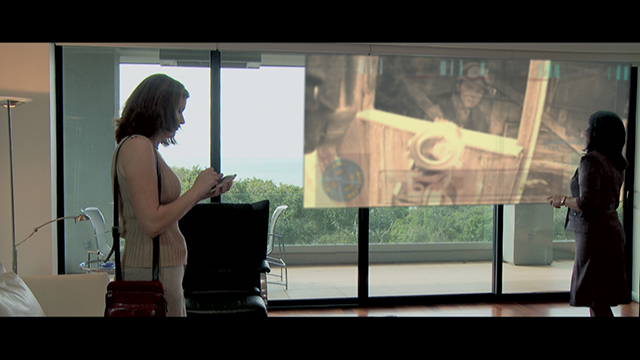 The movie MindScans (http://mindscans.com) features a transparent displays in an office setting that utilizes gesture control, and on a tablet that is controlled via a more traditional touch interface. According to Director Ben Chiu, many of the devices in MindScans did not exist at the time of filming. He says, "the iPad wasn't even a product yet. What's funny is people see these things in MindScans now and don't even give them a second thought. "There are many more tech devices depicted in MindScans than most people realize. Ben says, "some are pretty cool really, but because their importance, in regards to moving the story along, was nil, they're just in the background." Can you spot some of these advanced technology in MindScans?